Carvin Eison is the project director for Re-Energizing the Legacy of Frederick Douglass. He says it's important to connect Douglass's lessons to issues affecting America today. NY Assemblyman Harry Bronson has been supportive in efforts to move the original monument to a more visible spot of Highland Park. He says he identifies with Douglass because he is fighting for equality and dignity for the LGBT community. 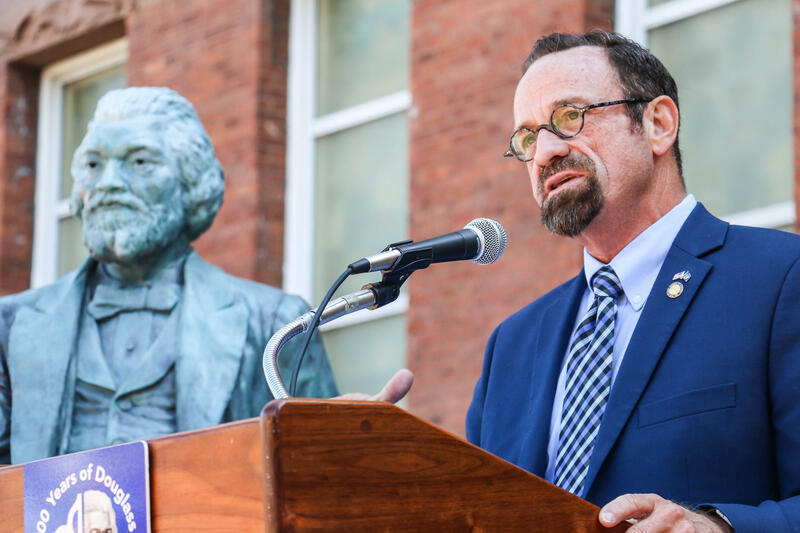 Carvin Eison says there will be a total of 13 statues placed around key points of the city where Frederick Douglass made a difference or influenced society. 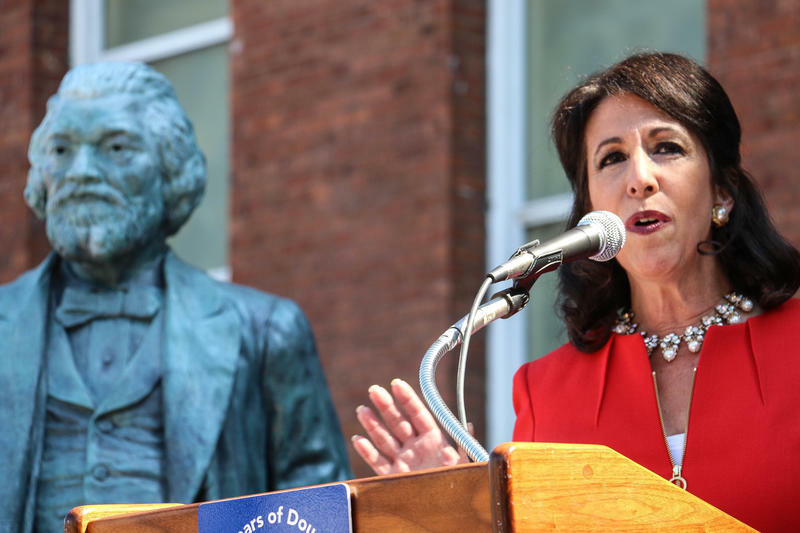 County Executive Cheryl Dinolfo says she's excited to support efforts to uplift Frederick Douglass's legacy. She has been working with NY Assemblyman Harry Bronson to move the original monument to a more visible spot of Highland Park. Sculptor Olivia Kim worked with more than 4 dozen volunteers to create 13 statues. Three are done, 10 more will be completed and installed in coming months. 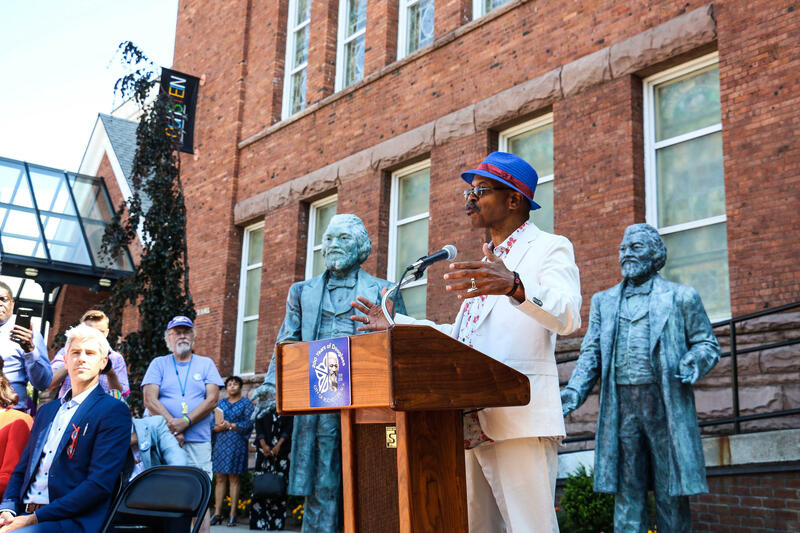 The statues are life-sized and meant to take Douglass' legacy off of the podium "and bring it to street-level," Carvin Eison says. 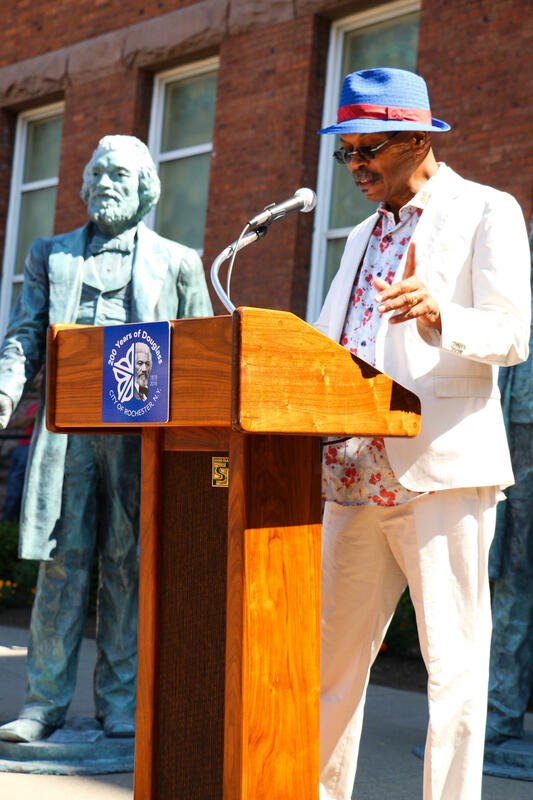 Project Director Carvin Eison unveils the Frederick Douglass statue. Frederick Douglass was the first Black American to have a monument erected in his honor. 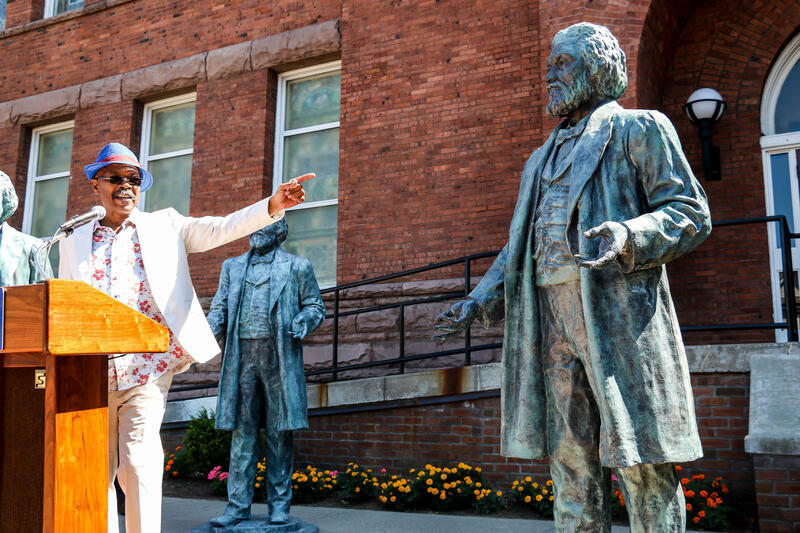 Now, more than a century later members of the Re-Energizing the Legacy of Frederick Douglass committee are working with local officials, artists and community leaders to create 13 life-sized monuments, all coming together to create a city-wide interactive tour. 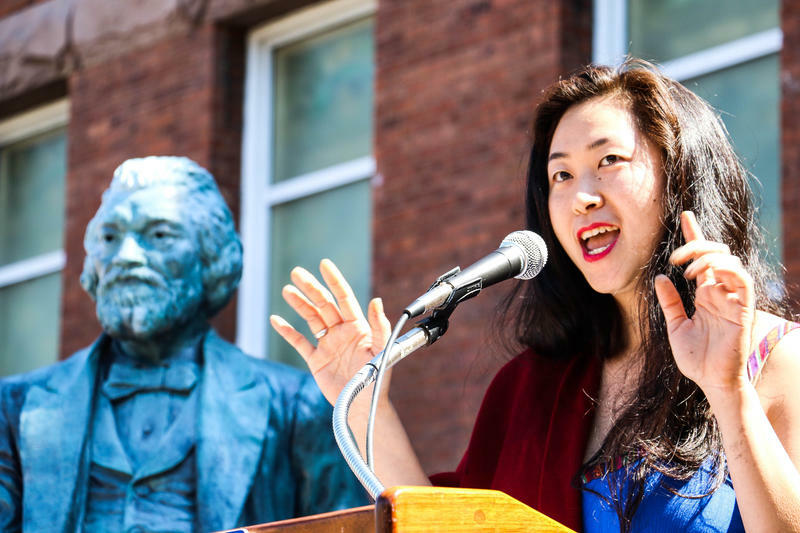 Sculptor Olivia Kim was chosen to design the monument and says she was heavily influenced by the one in Highland which was created by Stanley W. Edwards. To get the job done, she says she relied on the help of more than four dozen local artists, all of whom donated their time. Kim is originally from Rochester, and attended the School of the Arts before attending SUNY Alfred University, where she majored in ceramics. Her work has been shown all around the nation and in Europe and she was also part of the “No Soil Better” exhibit, inspired by Douglass and held at the Rochester Contemporary Art Center earlier this year. Kim’s statues differ in that the castings use the hands of Kenneth B. Morris Jr, Douglass’ great-great-great grandson. Committee members say this allows them to unite the past with the present while also pointing towards the future. Eison is referring to President Donald Trump’s clamping down on families seeking asylum and crossing the border. NY Assemblyman Harry Bronson, (D-Rochester), agreed. He is one of the first openly gay representatives in the state. “I think that as a gay man who has fought for equality throughout my adult life this has special meaning to me. It’s about the struggle,” he said. The first three statues will be placed outside of the Hochstein School, the Anne Murray Douglass Academy (School 12) and the Talman Building, where Douglass published the North Star, his flagship newspaper. The other 10 will be placed over the coming months, including at the intersection of Central Avenue and St. Paul Street where the Highland monument used to be located. The original Edwards sculpture, is going to be moved to a spot in Highland Park where it will be more visible. Organizers also announced the start of a four-day marathon read aloud of The Narrative of the Life of Frederick Douglass. Local officials, artists and other community leaders will participate by reading sections of the book at local libraries. Anyone is able to participate and any students who decide to read out loud get a free copy of the book. These activities are all part of the celebration of the 200th anniversary of Frederick Douglass's birth.